Average Weight	: 45 - 75 lbs. The first recorded mentions of the Pointer were in England around 1650. The Pointer was developed by crossing the Italian Pointer, Foxhound, Bloodhound, Greyhound, Newfoundland, Setter, and the Bulldog. The name derived from the way the dog stands motionless when he spots his game as if he is pointing right at it. Before hunting with guns was popular, Pointers were used to find hare for the Greyhound to hunt. By the early 1700s the Pointer became very popular among hunters. Excellent at catching a scent and pointing the hunter in the right direction, the dogs are very quick and can cover a lot of ground in a short amount of time and are often used to flush out birds. They are not water dogs nor are they expected to retrieve the kill. The dogs work great in warm weather but do not do well when it is very cold. The English Pointer often wins Pointing Field Trials over all other pointing breeds. The Pointer was been recognized in the USA & Canada in 1884. There is some debate regarding the origin of the Pointer, but they are known to have been in England as early as the 16th century and bred for use as hunting dogs. There is a great deal of hound in this breed, with greyhounds, bloodhounds and foxhounds in their genetic past as well as bull terriers. 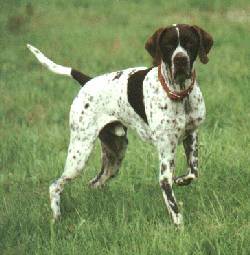 At the same time there was also a Spanish type of pointer that was probably brought to England and used in the breeding lines as well. They were first brought to the Americas in the 19th century for the very same use and were well established in the Eastern United States by the early 20th century. The famous dog Sensation is seen today as the emblem of the Westminster Kennel Club. •	Extremely Energetic and Tireless. •	Needs daily vigorous exercise to prevent restlessness. •	Love to Swim and Retrieve. Pointers have been bred to be a good hunting dog in the woods. They are alert and ready to obey commands. As such, they are very trainable dogs and will tightly bond with a master (or mistress) and family. Part of the reason pointers are so popular is their ease with children. They are devoted to their packs, and will tolerate all manner of high-pitched noises and ear pulling, while not being so small that a falling toddler could injure them. Pointer dogs are also very keen to be near their human pack whenever possible and do poorly when left alone for a long time. They can easily suffer from separation anxiety and should be trained with this in mind when they're very young. They are, however, bred to be constantly on the alert with high stamina, so they will always be ready for anything you have in mind and perhaps a bit more. If not exercised enough, they may become restless and sometimes even destructive. Owners will find that at least two hours of exercise a day will help keep destructive behaviour at bay, but anything less than that and your dog will go a little stir-crazy. Those with wide backyards will be able to leave the dogs out for a while since they're typically don't bark very much. Generally speaking, Pointers are among the best dogs for young families. They are gentle and loyal, while also being able to guard the house with a single low, deep bark from behind the door. Should the invader actually get inside your dog may not pose much of a threat, but most pointers will be aware of any incursions and alert you. With their human families they are just as content to run along on a bike ride as they are to just lie on the couch and watch TV. Their manners are very much like that of greyhounds who when retired from racing are famous as "couch potatoes." Whatever the pack is doing is just fine for your Pointer. Grooming regimens for Pointers are very simple. Their coat is virtually trouble free and a brushing, or even just a rubbing with a rough cloth every week or two will keep their hair down to a reasonable level. The hair is somewhat coarse and they usually enjoy a good scalp massage. The brushes with long rubber points will do a very good job of accomplishing both. Your pointer dog should also be inspected regularly for the appearance of the skin problems they can be prone to. If there is any significant change in your dog's skin, be sure and make an appointment with the vet to decide if it's something serious. Like all dogs, pointers are susceptible to attack by fleas and ticks. If your dog has skin problems, you might want to consult your vet before administering a flea prevention plan. Sometimes the collars can cause severe reactions, and not all dogs can tolerate the sub-dermal flea protection. Natural methods of flea control such as eucalyptus or neem may be more effective for such dogs. Their claws often are worn down with their incessant running, depending upon the terrain. If the ground is very soft where your dog runs, you may need to perform some nail trimming. For this reason, it's a good idea to get your pup used to the idea of having his or her paw handled for trimming operations. Thankfully, pointers are not very wilful and will usually submit to whatever treatments are necessary. Their floppy ears may require cleaning every few weeks, also. This should very gently be done with a gauze pad, being careful to wipe only around the outside of the ear and never into the ear canal. Since the sheen of Pointer fur comes from the protective oils their skin makes, you should try to avoid washing your dog as much as possible. A good rinse is allowable and many of them enjoy swimming, but a soapy bath should be an annual event. Pointers need plenty of exercise, often in excess of two hours per day. This means that if you're not keeping your dog out in the country, you'll need to take him or her to the park very regularly or devote a great deal of your day to dog-walks, without fail. Of course, few people have that much free time, and since they prefer to run around, pointers really appreciate having a nice big yard to tumble about in. As long as your fence is rather high, they should be able to be contained in even a suburban yard. Sometimes when there's more than one dog your pointer can get a little too much exercise, especially when one dog is old and the other is young. If your dog shows signs of limping or excessive panting in hot weather you'll want to make sure you take him or her in for a rest and examination. They are such strong competitors, they have been known to literally run themselves ragged-sometimes injuring themselves and not stopping. However, this rarely happens and you can be assured your dog will make a fantastic companion for hikes in just about anywhere. Their cost is short but dense, so they're suited to most climates and conditions. The Pointer is well known for its ability to take commands in the field, as long as the commands are well known. Puppies are often started from a very early age with running around and following verbal orders, though you shouldn't expect results until you've really drilled the point home, since they are not the smartest dogs out there. For those who want to keep a Pointer as a companion animal only, the most important training involves housebreaking and socialization with other people and dogs. The same devotion to early and consistent commands is important. You don't want to confuse the dog, and positive reinforcement is certainly best. It's up to you to give your pointer all possible opportunities to be a good dog and conversely, remove the chance for error, when very young. Housebreaking can take awhile no matter how willing and eager your dog is to please. For that reason, it is, vitally important that you're around constantly during the housebreaking process to take cues from your pup and keep an eye on his or her behaviour. Many people use crate training successfully and the dogs derive great comfort from having a space of their very own. Be sure you get a sufficiently large crate to give your dog space to stand and turn around. There should be no need to shout with a pointer-shunning the dog from your company is often more than ample punishment, though it is imperative that you never punish a dog for something if there's been any amount of time between the deed and your discovering it. They simply forget what they've done immediately after doing it. You should begin socialization training as early as possible, giving you new Pointer pup plenty of chance to play, off leash if possible, with other dogs. They are very rarely aggressive with other dogs, preferring instead to run and play. The same is true of new people whether in or out. However, if a family member is threatened your dog will respond with an impressive defensive display. Keeping them well exercised is the key to successful training. They have a great deal of energy, especially when young, and will take to their education far more readily of they've had a chance to blow of steam. Hyperactivity in dogs, as well as children, can make learning very difficult. Pointers love to hang out with their packs and will take commands from any member of the family as long as you all agree to a set of commands. As with any breed of dog, consistency is the key to effective training.